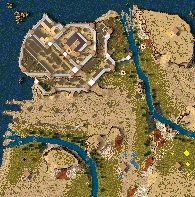 This map is intended to be played by 5 players, one of them beeing the lord of Karbash. Another player will help the Karbash lord to defend the citadel (and viceversa). On the other hand the other 3 players (in the south) will have an advantage in numbers but the disadvantage of having to siege the completed and multilayered wall citadel of Karbash. This map is inspired in a southern city of the book that I'm currently writting. It's the first map that I share with the community, I hope you like it! PS: It's made with version 1.3.1-E; which doesn't appear as an option in this forum. I hope this won't be a problem. PS2:Sorry for my bad English. This does look good on the minimap. I hope I could find some time play it as well. I like how you imagined it, and how you decided to use outposts. I'm sure it is a fun map to play. Won't have time to test it right now, but maybe I will in the future.